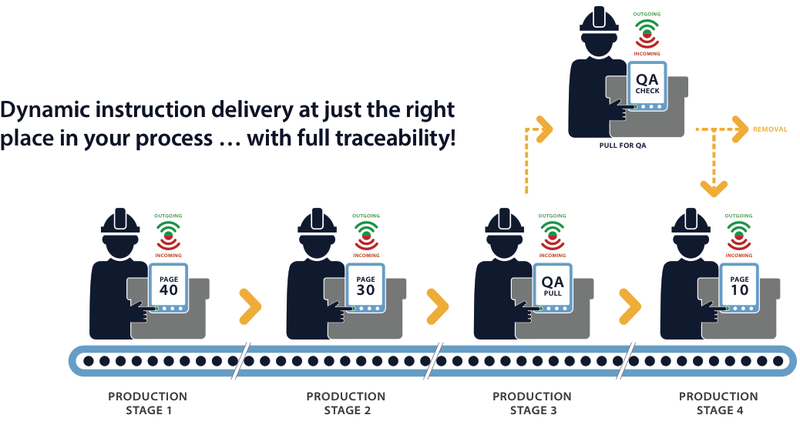 Efficient process workflows are the key to ensuring a seamless operation. The Work Instruction module provides the ability to send the appropriate instruction to the View tags on the factory floor to instruct the operators automatically. ProVIEW’s Work Instruction module provides the ability to manage your containers, re-schedule or re-direct jobs by rack or container, track the QA process and automatically count inventory for WIP items. Compared to expensive, static paper labels, this system is an exponential leap forward in cost savings, quality and the ability to manage the increasing complexity in modern manufacturing. Buttons on the tags allow operators to respond to or confirm instruction, providing the two-way communication necessary for process efficiency.